Vacationing in the Hocking Hills? Five Great Places in southeast Ohio to get your Butterfly Fix! Are you thinking of warmer times? Has Ohio's gray skies encouraged you to start planning your summer get-away? Don't forget to work butterflies into that vacation trip to the Hocking Hills. Here is our top five places in southeast Ohio to get in touch with butterflies. Trimble Community Forest is a secret spot that gets very few human visitors but some awesome butterfly visitors! 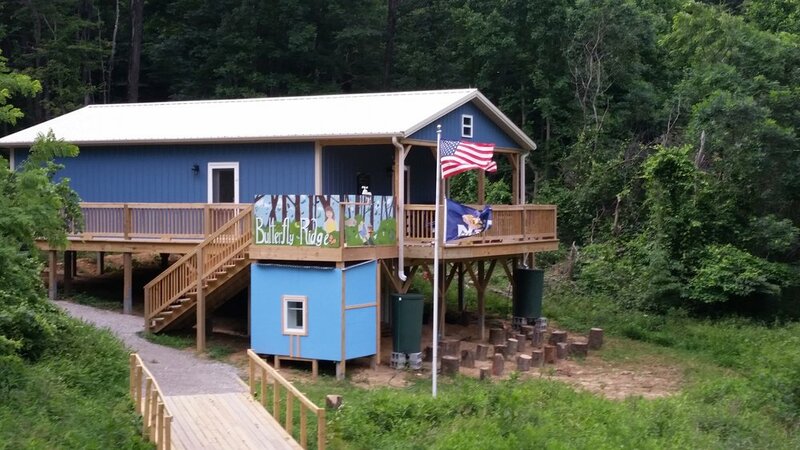 This site is owned by the Appalachia Ohio Alliance and is used as a landlab by the local Trimble school system. Early in the season (April), Elfins have been spotted but of course these butterflies are rare enough that there are no guarantees. Late June and early July are a much better bet, hence the reason why this is one of the stops on the Athens County Butterfly Count, which in 2018 will be held on July 7. Eastern Commas and Summer Azures are thick along the gravel road that enters the site, especially if it has been a wet summer. Also keep an eye out in this stretch for several grass skippers as well as Hoary Edge and Silver-spotted Skipper. This gravel road is well maintained . . . to a point. About a half-mile in you will see a very rough, four-wheel drive (if even that!) gas well road going up the hill to your right. Continue straight and the gravel road turns very wet, with puddles up to your knees, eventually leading you to a beautiful beaver pond. Or, turn right onto the gas well road and start your climb up the hill. This is where the butterflies get really interesting. Trimble is one of the few places in southern Ohio to find Northern Metalmark. While numbers may vary, it is a consistent find in the lower portions of the gas well road. Also watch for Banded Hairstreak. Once you reach the top of the treacherous hill you will find two large fields with old gas wells and lots of Butterfly Weed. These fields are great places to find Spicebush Swallowtail, Great Spangled Fritillary, and Pearl Crescent. Monarchs and Viceroys can be found in these fields as well. Also look for hairstreaks again in the wooded road that connects the two fields. Trimble also is a great spot for other kinds of wildlife including dragonflies, birds, and even beavers and muskrats at the pond! How to get there? Take OH78 out of Glouster toward Murray City. About one mile out of town turn left on Derthick Road (a sort of brick chimney is at the corner). Stay on Derthick Road and go about another half mile to mile. You will see the gate and sign on the right. Parking? Park near the gate (but don't block) or along Derthick Road. How long should I plan on being there? If you go all the way to the top of the hill, or all the way out to the beaver pond, plan to spend a couple hours here. Difficulty? The main gravel road into the site is an easy walk. The gravel road up to the gas wells is a MUCH DIFFERENT STORY and should only be tried by those in good physical condition with good shoes. Nearby Food? The Dairy Queen in Glouster makes the best blizzards on the planet!! Kasler's Country Kitchen in Trimble is also good as is The Corner Pizza and Deli in Jacksonville. The Ridges is the former Ohio Mental Hospital grounds. Not only are several of the old historic buildings still standing but there is also over 400 acres of property to explore. Following the Nature Loop and and interior gravel roads will give you access to a large portion of the property. The great thing about The Ridges is the variety of habitats including ponds, wetlands, deciduous forest, and fields. A one-day outing to The Ridges in the summer should yield at least 25-30 species of butterflies and while there isn't anything especially rare there, any time you can find 30 different species of butterflies on a single trip in Ohio is a good day! However, there are some unusual things you may come across during your visit. The section of gravel road near the new cell tower is especially good for Gemmed Satyr. The section of the Nature Loop just east of the pond near the parking area tends to be good for Emperors and Snouts. There are three cemeteries on the site where former patients are buried. The two cemeteries closest to Dairy Lane are good for finding American Copper. Trail along north end of property. On the north end of the property, west of the cell tower, the gravel road passes through an area with larger trees. This area is usually good for swallowtails, both Spicebush and Zebra. Black Swallowtail is a regular on Radar Hill on the northwest portion of the property. Walking the entire loop is close to three hours. While it is not an especially challenging walk, it is a long one so be sure to wear good walking shoes and have water with you. Parking? While there is parking near the historic buildings, for quickest access to the trail system park in the gravel lot along Dairy Lane. How long should I plan on being there? I would plan at least half of a day for a leisurely stroll around the entire loop. Difficulty? The main trail is a combination of gravel road and gravel trail. There are a couple hills but not anything terrible. Wear good shoes because it is a long walk. Nearby Food? Athens has no shortage of eating establishments. Most places are either along Court Street in uptown Athens or along East State Street. The Webster Road site is an out-of-the-way place that few people are familiar with, making it the perfect butterfly hunting site. An old township road that is used primarily for horseback riding, this site is an ideal location to see puddling in action. The road is gravel (MUD!) most of the time and combined with the horse droppings from equestrian activity, this site is a puddling bonanza. Depending on the season it is not uncommon to see Eastern Tiger Swallowtails by the dozens puddling in the middle of the road. Eastern Comma, Red-spotted Purple, Spring and Summer Azures, even Northern Pearly-eye are frequently encountered. Early in the season, Duskywings are the puddlers of choice. Webster Road is also a reliable site for Silvery Checkerspot. Roughly a quarter-mile from the parking circle the road crosses a small creek (use rocks in the creek to safely cross). On the opposite side of the creek in a thicket of Wingstem is where the Checkerspots are reliably found. There are several side tracks that you can follow as well, but I have found that the best butterfly activity is on the main road. This site is also very interesting botanically. In the spring, ephemerals like Bloodroot, Creeping Phlox, Dutchmen's Breeches, and Sweet Cicely are found. In the fall, a variety of Goldenrods and Asters populate the roadside. How to get there? At the intersection of State Route 374 and Big Pine Road turn west (turning east takes you to Conkle's Hollow). About two miles down Big Pine Road you will turn right onto Webster Road. Follow until you get to teardrop parking area. Parking? Normally there is plenty of free parking available in the teardrop. How long should I plan on being there? If you stick to the main road plan on about an hour long visit. If you are more prone to exploring, plan at least half of a day. Difficulty? Easy, but wear shoes you won't mind getting wet and muddy. Nearby Food? Webster Road is sort of in the middle of nowhere. The closest food would be Grandma Faye's (closer to Old Man's Cave) where you can get pizza and deli sandwiches. Or continue down (west) on Big Pine Road to State Route 56 and follow it into Laurelville. We are big fans of The Ridge Inn in Laurelville, a quaint little café with lots of great meals and desserts. Clear Creek Metro Park is much like The Ridges, where you can put up some big butterfly numbers if you are willing to invest the time. Clear Creek offers a wide variety of trails of a variety of lengths and distances. The two trails I strongly recommend are the Creekside Meadows Trail and the Good Prairie Trail. Creekside Meadows is a flat trail the runs parallel to Clear Creek. There a few meadows that the trail brushes past and this is where you will find most of the butterfly activity. If you arrive not long after a rain, be sure to check for puddling in parking lots. In the spring (April and May), Duskywings will be quite common in the parking lots with an occasional Swallowtail puddle party as well. A thought is to walk the trail between the two parking lots and then walk Clear Creek Road back to your car, as puddling next to the road can be quite common. Several of the Harvester butterflies I have observed here were actually sitting in the road. The Good Prairie is accessed from the Valley View picnic area on the west end of the park. The prairie comes into its own normally mid-late summer (July and August). In the prairie is a variety of good nectar plants including Butterfly Weed and Purple Coneflower to grab every butterfly's attention. Do not park along the side of the road at the prairie. While this will be very tempting, the rangers strongly frown upon this! How to get there? Exit US33 at Clear Creek Road (west) between Sugar Grove and Rockbridge. The Dogwood Crossing Too gas station sits on the corner. After a half-mile or so you will pass the Metro Park sign, with the next 4-5 miles of road being within the park. Parking? There are several parking lots along Clear Creek Road. You can pick up a map at any of the kiosks found in the parking areas. How long should I plan on being there? You can spend as long here as you have time, one-hour to a few days! Difficulty? The Creekside Meadow Trail and Good Prairie Trails are pretty tame. If you are looking for a stronger workout, the park has trails to fit that need as well. Nearby Food? The Dogwood Crossing Too gas station has a Subway (but no seating). A couple miles farther south is Rockbridge. The gas station in Rockbridge has a Burger King, and the Rockbridge Antique Mall has a couple different cafes and ice cream shops. Butterfly Ridge is dedicated to creating habitat for butterflies and other pollinators, and teaching others to do the same. Their habitats include woodland openings, wetland, pine forest, and prairie. Their current butterfly list stands at a whopping 53 species. June and August are the best months to see butterflies at Butterfly Ridge. They are especially rich in Swallowtails, with Spicebush, Pipevine and Eastern Tiger all being relatively common here. In the woodland openings both Carolina and Little Wood Satyr can number in the dozens. In the prairies several species of grass skippers can be found. While June and August may be the best butterfly viewing, April gives the best chance to see some rarities. In 2017 both Henry's Elfin and Eastern Pine Elfin were spotted here as well as Falcate Orange-tip. Butterfly Ridge also raises butterflies and moths. The caterpillar house is a favorite for families as is their treehouse that overlooks one of the woodland openings. They also have a gift shop with everything butterfly! A $5 admission fee is asked for access to the nearly one-mile trail that traverses through the 21-acre site. Guided tours (free with admission) leave at 1pm and 3pm. They also offer John Deere Gator rides for those whom the moderately difficult trail would be too challenging. How to get there? Butterfly Ridge is on the east side of State Route 374, about halfway between Rock House and Conkle's Hollow State Parks. Parking? There is plenty of free parking available in two gravel lots. Set your parking brake as both lots are on a slant. How long should I plan on being there? You can easily spend a couple of hours here. Difficulty? The one-mile trail does have a couple of small hills. The trail is either mulched or mowed the entire length. Gator rides are also available for handicapped visitors. Nearby Food? Butterfly Ridge is sort of in the middle of nowhere. The closest food would be Grandma Faye's (closer to Old Man's Cave) where you can get pizza and deli sandwiches. Or travel into Laurelville. We are big fans of The Ridge Inn in Laurelville, a quaint little café with lots of great meals and desserts. You can also bring a lunch and eat on Butterfly Ridge's beautiful covered porch.